River Falls City Hall is located at 222 Lewis Street, River Falls, WI 54022; phone: 715-425-0900. Photo: Roscius S. and Lydia R. Freeman House, ca. 1908, 220 North Third Street, River Falls, WI. Listed on the National Register of Historic Places in 2007. Photographed by User:AlexiusHoratius (own work), 2010, [cc-by-3.0 (creativecommons.org/licenses/by/3.0)], via Wikimedia Commons, accessed December, 2014. The community of River Falls is situated on the banks of the Kinnickinnic River approximately 10 miles east of the Mississippi River and 25 miles southeast of Minneapolis and St. Paul, Minnesota in west central Wisconsin. The town spans portions of both St. Croix County (north) and Pierce County (south) with the Freeman House located in the south half. The town, first platted as the village of Kinnickinnic in 1854, grew up after water power from the river of the same name was harnessed for sawmill operations by brothers Nathaniel and Oliver Powell. They received a U.S. land patent in 1852 and platted a village along the river two years later. By the late 1850s the village had grown to include ten commercial establishments as well as an assortment of flour mills, sawmills, and planing mills. The population grew dramatically from 312 in 1860 to 1,191 in 1870, and by the late 1870s the village had a total of five flour mills producing 150,000 barrels annually. Portions of the villages of Greenwood Falls and East Troy were eventually incorporated along with Kinnickinnic to form River Falls. In addition to milling, two other developments in the decades prior to 1900 contributed to the overall growth of the community: the construction of rail service to the town and the establishment of a state normal school. The first rail connection came in 1878 when the Hudson and River Falls Railroad completed a short line from Hudson, Wisconsin to River Falls. The railroad was extended to the county seat of Ellsworth in 1885 and the H & RF Railroad was absorbed by the Chicago, St. Paul, Minneapolis & Omaha Railroad a short time later. In addition to transporting passengers, the railroad became essential for shipping wood products and flour. 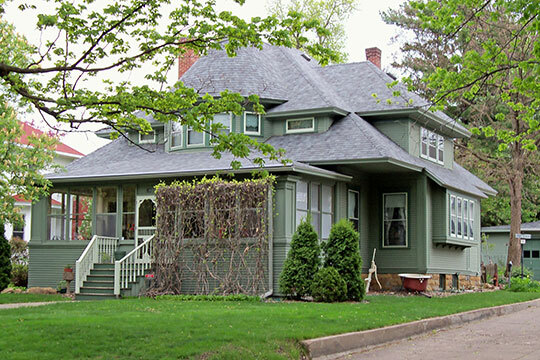 It was during the last half of the 19th century and the first decades of the 20th century that many of the city's residents built permanent houses that survive in River Falls more than 100 years later. Homebuilders included a cross section of factory owners, downtown business owners, a range of professionals, working class tradesmen and their families, and administrative and teaching staff affiliated with the State Normal School. Early commercial building had been built along the spine of Main Street with residential development extending to the east and west. Industrial sites along the town's rivers and mill ponds were generally not considered good residential building sites. Instead, the locations of early churches, the first public school and the State Normal School drew residential development. Their scattered locations resulted in dispersed residential development in the early years. Infill of vacant blocks and isolated empty lots came over time. Marlys A. Svendsen, Svendsen Tyler, Inc., Roscius S. and Lydia R. Freeman House, Pierce County, WI, nomination document, 2006, National Park Service, National Register of Historic Places, Washington, D.C.